All aspects of state and federal court litigation, including written discovery, depositions, motion preparation and briefing, hearings, and trial. Cases resolved by dispositive motion whenever possible to ensure efficiency and avoid delay. Prepared appellate briefs and participated in oral argument before the state and federal Courts of Appeals. 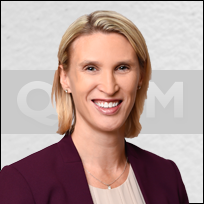 Ms. Schout’s practice focuses primarily on handling many of the firm’s appellate matters for residential lending clients. In addition, Ms. Schout represents residential lending clients in litigation throughout Texas. She also devotes a significant portion of time to insurance coverage disputes involving both liability and first party property issues. JPMorgan Chase Bank, N.A. v. Classic Home Fin., Inc., 548 Fed. Appx. 205 (5th Cir. 2013) 2009.